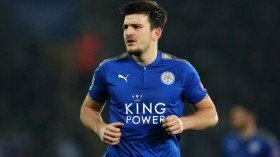 Manchester United have reportedly decided to retain their interest in signing defender Harry Maguire from Leicester City at the end of the campaign. The England international was widely tipped to join the Red Devils following last summer's World Cup before he committed his future to the Foxes on a new long-term contract. According to The Star, the player's extension has not ended United's interest in signing him and they are prepared to renew their pursuit when the season comes to a close. It is added that the Mancunian giants are prepared to make a bid in the region of £65m for the defender, who is said to hold an interest in joining the Old Trafford outfit. Maguire had been fancied to follow Riyad Mahrez through the exit door last summer, but he eventually decided to pen an extension after the Foxes made it clear that they would not entertain his exit at any cost. He has more than four years remaining on his current deal.